All the elements of a stellar career are there: he studied at the London School of Economics and Courtauld Institute of Art, was Editor of The Burlington Magazine, Assistant Director of the Barber Institute of Art and Professor of Art History at Manchester University. His career lasted over five decades. He published books on Glyn Philpot and on stained glass in the circle of William Morris, books that are still quoted as authorities on these subjects. He wrote numerous articles for prestigious and popular journals alike, such as Apollo, Gazette des Beaux-Arts, The Connoisseur, Art Quarterly, Museums Journal and The Listener. In the course of the 1950s he contributed with over sixty articles to the Manchester Guardian as their art critic. And yet, who today remembers Albert Charles Sewter? In the course of two blogs I shall explore Sewter’s biography and his writings for the Burlington to investigate why his reputation has failed to endure. Sewter began his career in the Midlands: in 1935 he was appointed Arts Assistant at the Leicester Museum and Art Gallery where he remained until 1939. At Leicester Sewter was responsible for a progressive acquisition policy, which emphasised the purchase of contemporary British and European art, including German. In 1936 he began to write for the Burlington and in November 1939 was appointed Editor of this magazine when Herbert Read left for the ill-fated project of founding a museum of contemporary art in London. Only 27 at the time, Sewter continued the line of scholarship established by Read, publishing articles by Erwin Panofsky, Kenneth Clark, Paul Ganz, Frederick Antal and many others. Soon, however, Sewter left London for Birmingham: in 1940 he was appointed Assistant Director of the Barber Institute of Fine Arts. Nevertheless, he continued to contribute articles and reviews to the Burlington until he retired. At a time when the international scope of the Burlington was inevitably restricted by the War, Sewter widened considerably its scope within the national collections: he wrote on works and exhibitions from Leicester, Manchester, Sheffield, Liverpool and Birmingham. After being on war service from 1942 to 1946, Sewter returned to the Barber Institute. He was also Art Adviser to Leicester Museum and Art Gallery (1948-1949), consultant on Prints for the Whitworth Art Gallery (Manchester), and a founder member of the Institute of Contemporary Art in Manchester. In 1949 he became Senior Lecturer at the University of Manchester, where he remained until his retirement in 1973. In 1952 Sewter published a re-edition of The Art of Fresco Painting by Mary Philadelphia Merrifield. His most acclaimed work, Stained Glass of William Morris and his Circle, appeared in 1974. A manuscript on the life of the British painter William Artaud (1763-1823), written in 1951, was never published. Sewer was a collector too and in the course of the 1960s he donated works of art to the National Portrait Gallery, Tate Gallery (Geoffrey Tibble, Still Life, 1929), Manchester City Art Gallery and Whitworth Art Gallery. The extent and scope of his art collection, however, has yet to be uncovered. The son of a painting conservator, Sewter had a strong object-based approach to works of art. For Sewter like for Read, however, formalism was only the starting point to the development of a wider analysis, that, in the case of Sewter, was always supported by strong documentary evidence. For instance, his Burlington article ‘Four English Illustrative Pictures’ (March 1939) is a study of four works from the collection of George Beaumont by Sawrey Gilpin (1733-1807) and Johann Zoffany (1733-1810), in which the formal analysis and stylistic attribution of the paintings are joined to the investigation of their literary sources: Jonathan Swift for Gilpin and David Garrick for Zoffany. I illustrate here Zoffany’s theatrical piece from the one-act satirical farce Lethe, or Aesop in the Shade, the first play written by David Garrick in 1740. 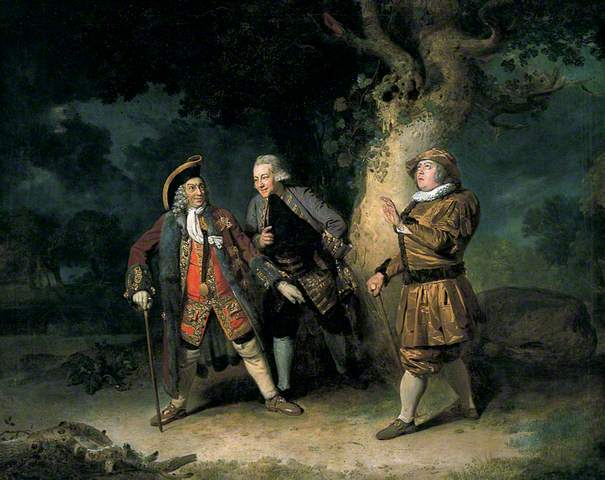 Sewter identified correctly the main characters (left to right: David Garrick as Lord Chalkstone, Ellis Aicken as Bowman and Astley Bransby as Aesop) and the exact moment of the play (when Aesop exclaims ‘Does your Lordship propose a wager as a proof of the goodness of your head?’). This work was later acquired by Birmingham Museum and Art Gallery with a grant from the Art Fund (1948). Sewter operated outside London: he concentrated his research on works kept in provincial museums and organised exhibitions outside the capital. This was certainly an important factor in the marginalisation of his work. Sewter’s choice to operate from a geographical periphery resulted in his work to remain at the periphery of art history. Illustration: David Garrick as Lord Chalkstone, Ellis Aicken as Bowman and Astley Bransby as Aesop in the dramatic satire ‘Lethe’, by Johan Zoffany, ca. 1766 (c) Birmingham Museums and Art Gallery; Image supplied by The Public Catalogue Foundation (this work was illustrated by Sewter in his article ‘Four English Illustrative Pictures’, The Burlington Magazine (March 1939), pp. 122-127. ‘Albert Charles Sewter.’ Who’s Who in Art, 1949-1950, p. 406. Geoffrey Tibble: October, 1936, London, 1936. Glyn Philpot, London, Batsford, 1951. A lecture on the relationship between painting and architecture in Renaissance and modern times, delivered to the Manchester Society of Architects, 13th February, 1951, London, A. Tiranti, 1952. (revised) Maria Philadelphia Merrifield, The art of fresco painting, as practised by the old Italian and Spanish masters, with a preliminary inquiry into the nature of the colours used in fresco painting, London, Alec Tiranti, 1952. Water Colours by JM Turner, Manchester City Art Gallery, 1953. Geoffrey Tibble 1909-1952, Manchester City Art Gallery, 1958. Canadian trio: Paul-Emile Borduas, William Newcombe, Jean-Paul Riopelle, Manchester Institute of Contemporary Arts, Manchester City Art Gallery, 1961. James Davis, Manchester City Art Gallery, 1961. The new London situation: an exhibition of paintings by Bernard Cohen, Peter Coviello, John Hoyland, John Plumb, Peter Stroud, William Turnbull, Manchester, Institute of Contemporary Arts, 1962. Modern British Woodcuts and Wood Engravings in the Collection of the Whitworth Art Gallery, Manchester, Whitworth Art Gallery, 1962. Denis Bowen, dedicated to the Astronauts, Molton Gallery, London, 1963. Cosmopolis: Artists of the School of London, Manchester, Whitworth Art Gallery, 1964. Small sculpture and drawings: an exhibition arranged by the Manchester Institute of Contemporary Arts, Manchester City Art Gallery, 1964. Five Centuries of German print-making, Manchester, Whitworth Art Gallery, 1967. The surrealist paintings and drawings of Sam Haile, Manchester Institute of Contemporary Arts, 1967. Mica presents Donald Cordery, Rodney Murray, Robert Rofe, Stephen Sartin, Donald Smith, Gordon Snee, Geoffrey Woohead, Manchester City Art Gallery, 1968. (with D. Maxwell White) I disegni di G.B. Piazzetta nella Biblioteca reale di Torino, Rome, Istituto poligrafico dello Stato, 1969. Baroque and Rococo Art, London, Thames and Hudson, 1972. The Stained Glass of William Morris and his Circle, New Haven, Yale University Press, 1974.